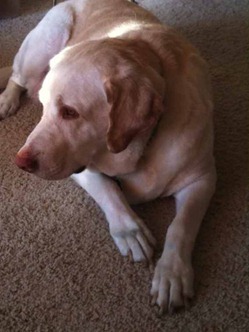 The iPad and the iPad 2 are amazing and powerful devices. 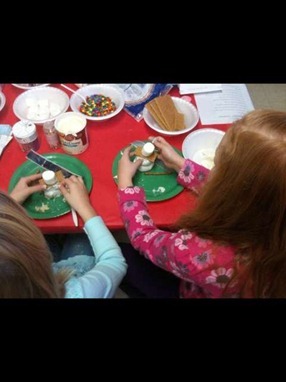 To help you do amazing things with it, we offer this collection of tips and tricks and how-to articles. Some of these are iPad Basics sort of stuff that are helpful for newer users- for instance, how to instantly jump to the top of a web or email page, how to save images from the iPad web browser or email apps. Others are how-to’s that are useful even for iPad power users – things like how to print from the iPad, or the best ways to get photos and videos transferred from an iPhone to the iPad without having to connect to a PC, or how to disable In-App purchases so your kids can’t inadvertently run up your App Store spending. 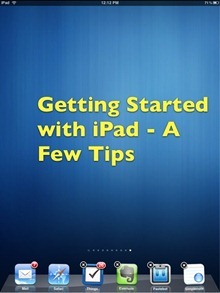 I hope some of these iPad tips will help you get the most out of your iPad. I spotted a basic but very cool iPad keyboard tip the other day, over at the iPad in Canada site – on how to insert an apostrophe quickly via the iPad keyboard. This method allows you to insert an apostrophe straight from the main Qwerty section of the keyboard, without having to shift over to the numbers / special characters section. All you need to do is tap on the comma key and hold for just a second or two. You’ll see the apostrophe symbol popup in blue. Once you see that, just release the key and the apostrophe will be inserted – much quicker than having to swap keyboard areas. 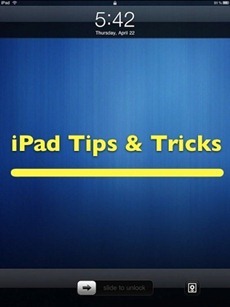 Thanks to Danielle at iPad in Canada for the tip. 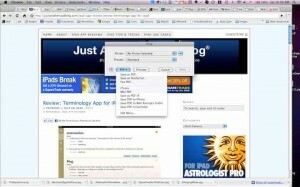 Are You Using the iPad Bookmarks Bar in Safari? As in, the thin bar running just below the address bar and search field etc. at the top of the Safari app. I use it constantly in my desktop browsers to have quick access to sites and online services I most often visit – but had never thought to use it on the iPad until reading a tip at Mac OS X Hints about it. One of the very first things Steve Jobs mentioned about the iPad when he introduced it is the ability to set custom wallpapers for both the home screen and lock screen. 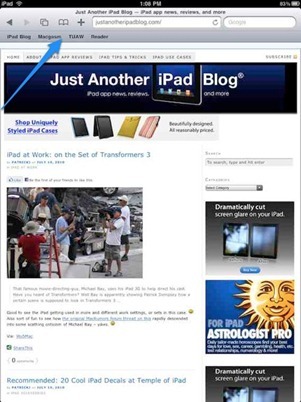 This is a nice, and very easy, way to personalize your iPad – so it seems well worth a quick how to post. 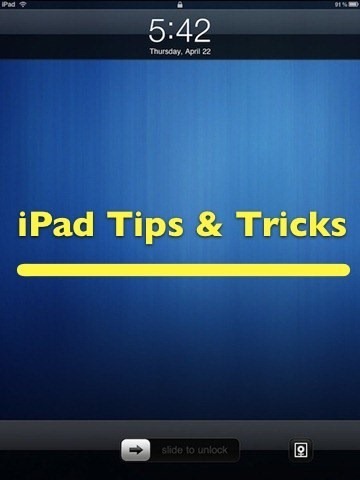 Here’s another basic but very handy tip for those of you who are new to the iPad. You may often receive a photo in an email that you want to save and keep on your iPad – or spot an image in a web site that you’d like to save. 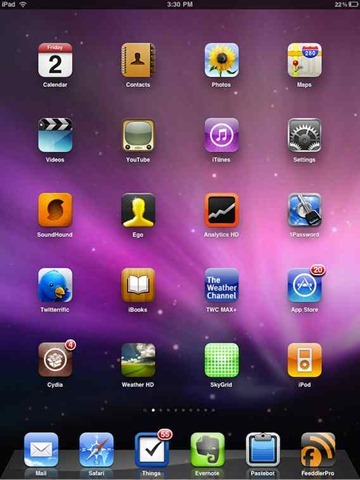 Just like the iPhone and the iPod Touch, the iPad is able to take a screenshot, to capture the contents of its current screen as a new image. This is very easy to do, and there is also a neat little trick for creating new images out of existing photos via the screenshot feature on the iPad. 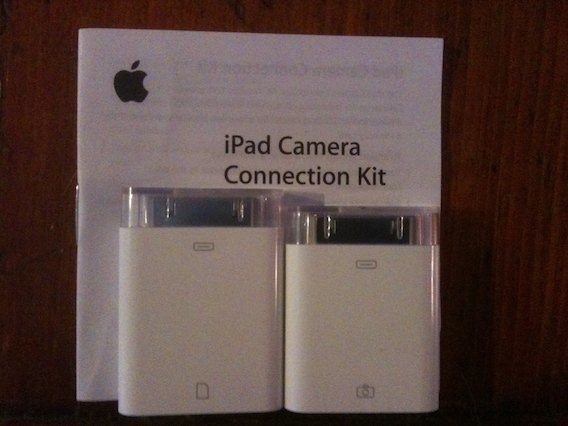 Today is iPad Launch Day Part 2 – the day that the iPad WiFi + 3G models hit the streets. I’ve had my WiFi only iPad for just about four weeks now, so this seems as good a time as any to share a few quick ‘iPad Starter’ type tips. Touch wood, I have not experienced any WiFi issues with my iPad so far – but I know there are a lot of folks who have been reporting problems of this sort. For those who do, Apple has got a Knowledge Base support article on the subject – with a rundown of symptoms and possible fixes for the issues. If you thought the iPad was going to make for a gorgeous digital photo frame, you were absolutely right. This is already one of the many pleasures I’ve found in the iPad. I’ve got my iPad dock placed just to the right of my main MacBook on my desk – and it is a perfect spot to enjoy some great family photos when I put the iPad into Picture Frame mode.